I love my friends. I love that they are always willing to let me mess with them and take their pictures. Lexi was my model for this tutorial. Isn’t she awesome? She makes a fantastic model. And I love her. Anyway, I’ve been wanting to show you guys how to do a DIY “Rosie the Riveter” Photo Shoot | “We Can Do It!” Poster for a while and I’m so glad that I’ve finally done it! I ADORE vintage style photography and art and like to recreate it with my own photography. You can see more of my pin-up/vintage style photography in my DIY Pin-Up Calendar tutorial as well as in my Pin-Up category under photography. – Yourself or a willing friend. – A camera (if you are taking these of yourself without help, I’d recommend picking up a remote for about $15). – A tripod (only necessary if you’re taking these of yourself). – A well lit room or area near lots of natural light (aka sunlight). Garages rock for this. – A yellow blanket or background of some kind. – Something to hang the backdrop on. I have a pvc pipe backdrop stand that I made following this tutorial from Dandelions on the Wall. You could also simply hang it up with thumbtacks against a wall. – Something to sit on. I seriously made my friend sit on a water cooler that happened to be in my garage. I know, super classy. – A chambray or denim shirt. – A red (preferably polka dot) scarf or bandanna. FYI’s: I used a Nikon D7000 DSLR to take these, but don’t let that worry you. Use the camera you have. Make sure the flash is off and your subject is placed close to the natural light but not directly in it (open-shade). Lexi is about to dive into the world of personal training so I thought it would be awesome for her to have a tough chic pic like this for her site or business cards. What would you do with your “Rosie the Riveter” inspired photo? 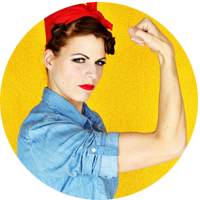 STAY TUNED FOR THE HOW-TO ON EDITING YOUR DIY “ROSIE THE RIVETER” PHOTO TO LOOK LIKE AN AWESOME VINTAGE POSTER!! You’re gonna love it! Do you like these photography tutorials? If so, what kinds of questions would you like me to answer or what types of tutorials would you be interested in? Thanks my friends! Have fun!